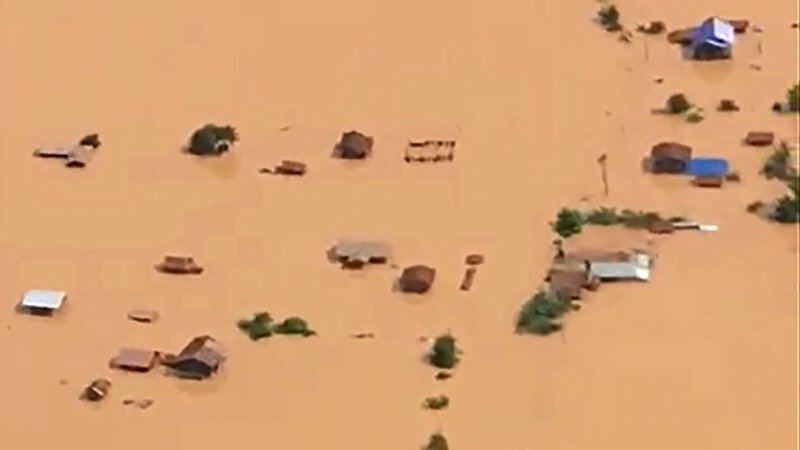 LAOS: Hundreds are missing and an unknown number feared dead after a partly built hydropower dam in southeast Laos collapsed after heavy rain and sent a wall of water surging through six villages, state media and contractors said yesterday (July 24). Laos News Agency said the accident happened on Monday evening (July 23) near the border with Cambodia, releasing five billion cubic metres of water – more than two million Olympic swimming pools. “We do not have any formal information yet about any casualties or how many are missing,” an official in Attapeu province, where much of the flooding occurred, said on condition of anonymity, adding that was no phone signal in the flooded region. The $1.2 billion (B40.120bn) dam is part of a project by Vientiane-based Xe Pian Xe Namnoy Power Company, or PNPC, a joint venture formed in 2012 between a Laotian, a Thai and two South Korean companies, according to the project’s website. “The incident was caused by continuous rainstorm which caused high volume of water to flow into the project's reservoir,” it said in a statement. South Korea’s foreign ministry said another Korean firm, Korea Western Power, was also involved. The companies and others had sent helicopters, boats and rescue workers. Pope Francis said in a Vatican message he had learned with sadness of the loss of life, and expressed “heartfelt solidarity” with all those affected. It planned to export 90% of its electricity to energy-hungry Thailand and the remainder was to be offered up on the local grid. “Many of these people have already been relocated or suffered impacts to livelihoods due to the dam construction and are now experiencing further devastating impacts – loss of homes, property and family members," she said. Laos has been keen to turn itself into “the battery of Southeast Asia” with a series of massive hydropower projects that has sparked opposition in downstream Mekong nations like Vietnam and Cambodia, who fear it will disrupt vital ecosystems, fisheries and their own river systems. Communist authorities in Laos keep tight control on information and are often opaque about business deals and development projects. The media is state-controlled and the government vigorously pursues dissent or protesters. “Once they cast themselves as the battery of Asia, exporting electricity became one of the major revenue sources, so it’s basically selling natural resources such as water,” Toshiyuki Doi, Senior Advisor at Mekong Watch, said.